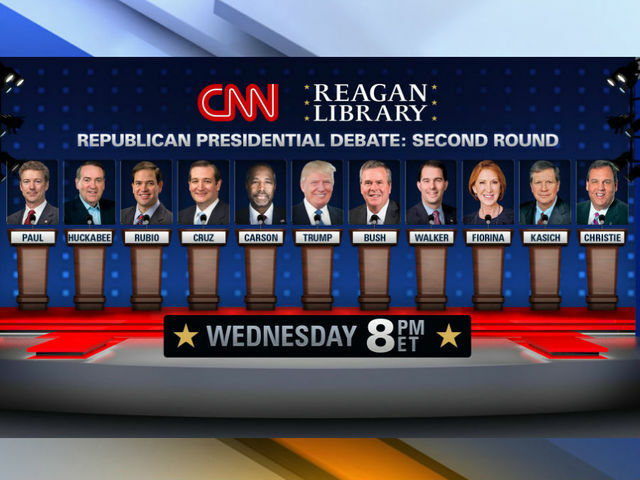 CNN has completed the polling analysis and confirmed that eleven candidates will share the main debate stage next Wednesday at the Reagan Library Republican Debate. The additional candidate, of coruse, is Carly Fiorina who made it onto the main stage after an addendum to the rules used by CNN to determine the top ten candidates. Essentially the lineups will be identical to the Fox News debate with the exception of Carly Fiorina who has graduated to the “adults” table in primetime. Eleven Republican presidential candidates have qualified for next week’s primetime debate, a slate that features the full diversity of the GOP’s 2016 class and is believed to be the largest group to share a presidential debate stage in modern political history. The candidates scheduled to meet for Wednesday’s primetime affair, announced Thursday night by debate host CNN, will include former technology executive Carly Fiorina, whose weak polling numbers kept her out of the first debate. But a bump in the polls and an aggressive lobbying effort persuaded CNN to broaden its participation criteria, a coup for Fiorina and GOP officials eager to feature the party’s only 2016 female candidate in the nationally televised clash. But don’t expect Fiorina to get as much airtime as Donald Trump, who will be positioned front and center when the candidates meet at the Reagan Presidential Library in Simi Valley, California. The undisputed leader in national polls, Trump is generally considered the biggest reason why Fox News Channel reached 24 million people for the first GOP presidential debate last month — the most watched program in Fox News history. The good news, for the eleven candidates, is that the main debate will span three hours from 8pm to 11pm ET. That will give more time for questioning compared to the two hours allotted by Fox News on August 6. –Let us hope it gives “more time for ANSWERING,” instead of Fox’s hogging of time for its own network talking heads! I found this neat chart, clearly showing not only how the candidates stand, but also how candidates have risen–or fallen (Walker is in free-fall). Pity they didn’t just make the line at 5%. Then, we’d only have Trump, Carson, Bush, Cruz, Walker, and Rubio up there. Christie has dropped to 2.8%. He should have been dropped to let in Fiorina (who is now ahead of Christie, Kasich, and Paul (tied with Huckabee). Also interesting: ALL of the other “kid’s table” candidates dropped even farther behind. I think that shows the unfairness of Fox (and now, CNN) deciding they aren’t worth listening to. Walker is imploding right now in poll numbers. He’s dropped to less than “Undecided” in the latest Iowa poll. That doesn’t bode well. Walker is Chris Parnell from SNL–but without the wit. He has the same clueless/awkward gestures (but, in his case, unintended). “Doesn’t bode well” for him, but bodes well for the Party. So glad it is not Fox and Magyn. Still hoping they will fire her. After this debate I believe Donald will move to 40%. Blacks, Women and Hispanics are fast joining the Donald Movement because it means JOBS, LESS TAXES, LESS GOVERNMENT REGULATION, STRONG MILITARY, GOOD TREATMENT FOR VETS, RESPECT FOR AMERICA, STRONG POLICY AGAINST IRAN, CHINA, RUSSIA, MEXICO, AND JAPAN, SECURE BORDERS, PRO-LIFE, AND GENERALLY A REBIRTH OF AMERICA AFTER THE LAST 8 YEARS OF DISASTER.